We took each 17 battalions divided in 4 brigades. Each brigade would have a superior battalion or one of grenadiers plus one medium artillery battery. 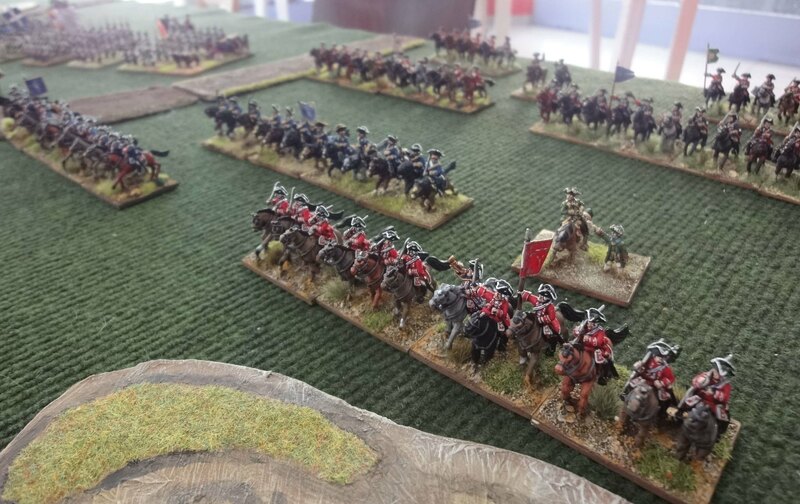 Two cavalry brigades, one with 2 cuirassiers and 1 dragoon regiment, the second with 1 cuirassiers and 2 dragoons regiments and one independent unit of hussars. All the commanders would be dependable and DogVag's Prussians would have +1 move and fire bonus and the no movement penalty, as per the national characteristics of Early SYW Prussians. 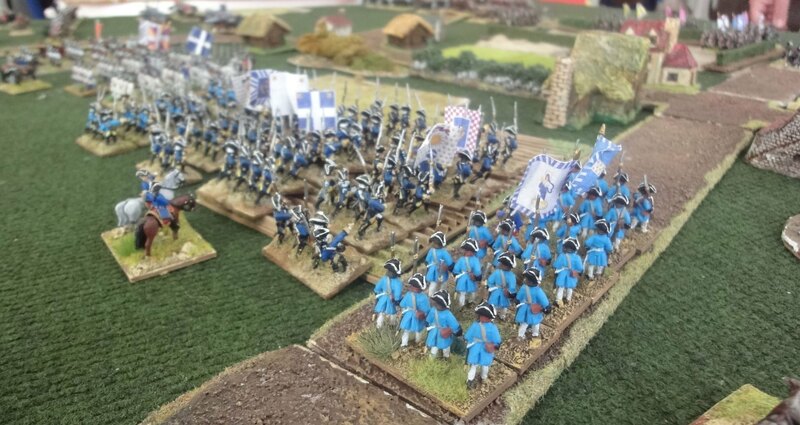 My French would be saddled with their respective national characteristics, one of my battalions would be light and I split one regiment of dragoons in two small regiments. 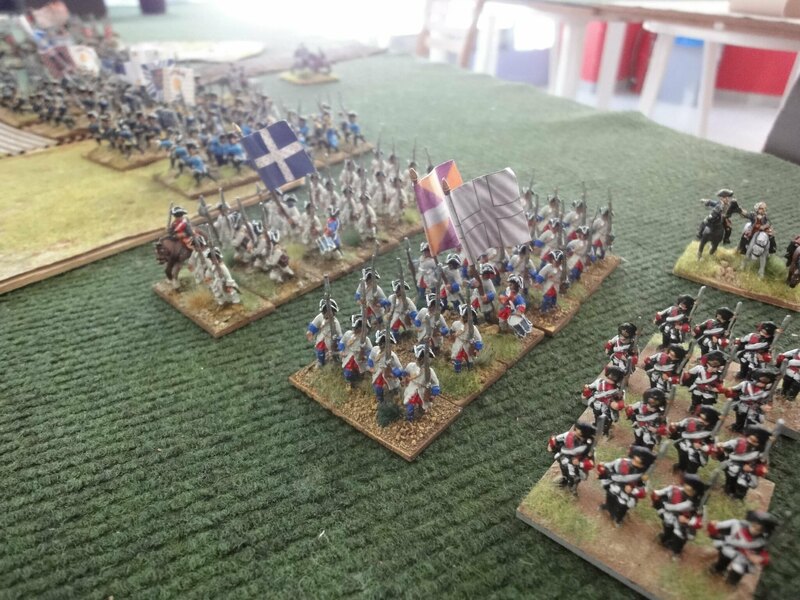 For deployment I proposed the French to deploy one brigade first, then the Prussians one brigade, keeping one last brigade in reserve, to enter from our side of the table whenever we thought it was time. The main features of the table setup were one town and one village (both soft cover) posted on two crossroads. 3VP for holding the town and 1VP for the village at the end of the game. An impassable terrain, one pond, woods and some walled fields, would funnel the action to the in focal points, the town and the village. 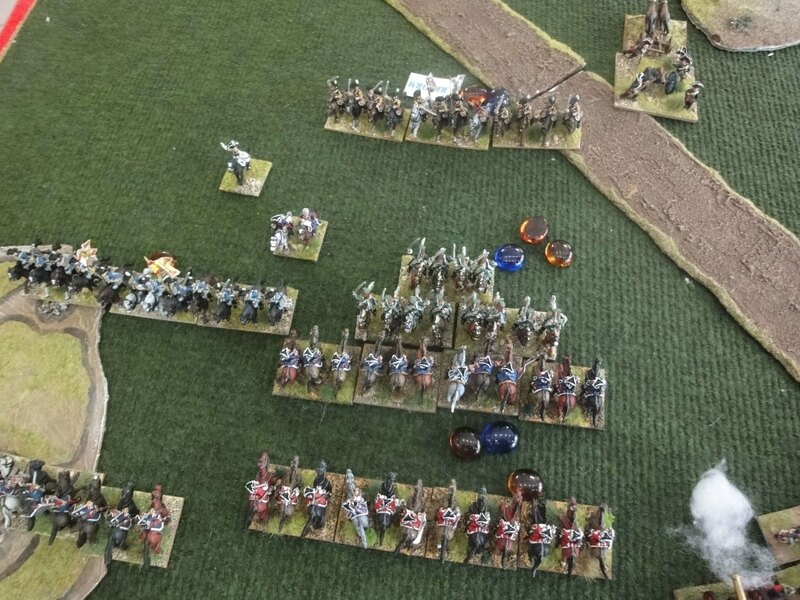 There would be also open terrain, suitable for cavalry action. The picture above taken from the French side of the table. 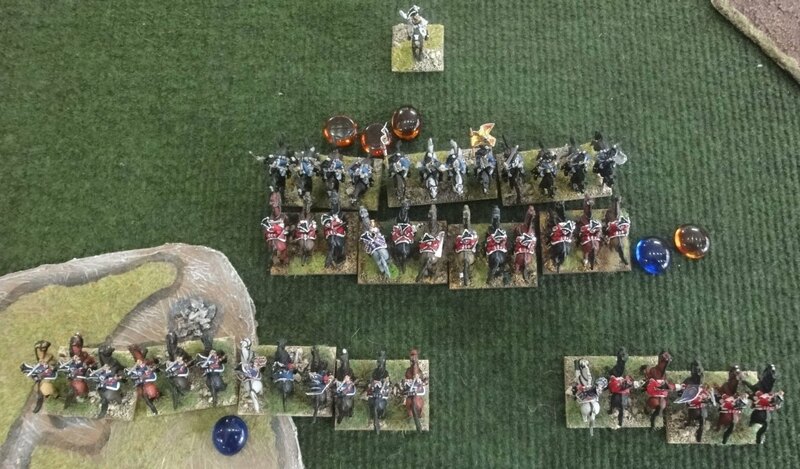 Doc Vag kept a cavalry brigade in reserve, his right wing cavalry is his first brigade (2cuir 1drgn), plus the Independent Hussar Regiment. 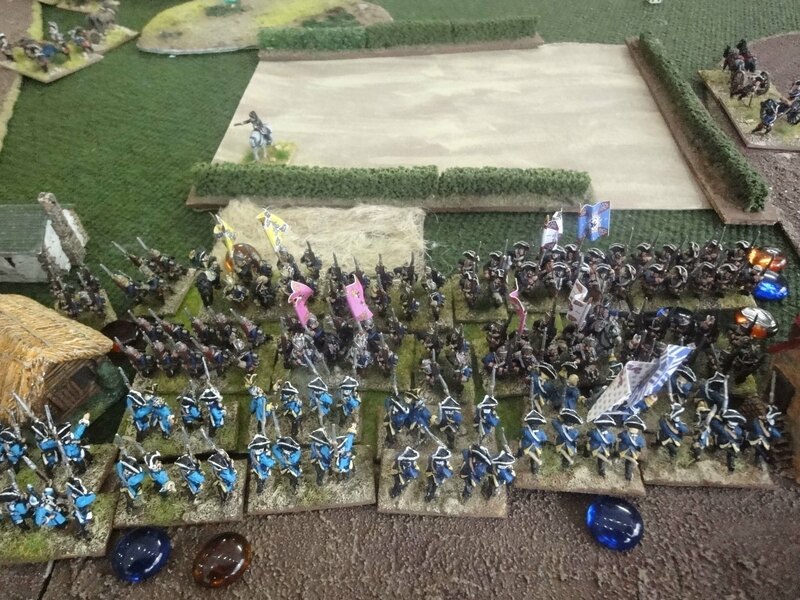 All my cavalry at my left wing, I only let the independent hussars at my extreme right. I left out an infantry brigade, as a reserve. 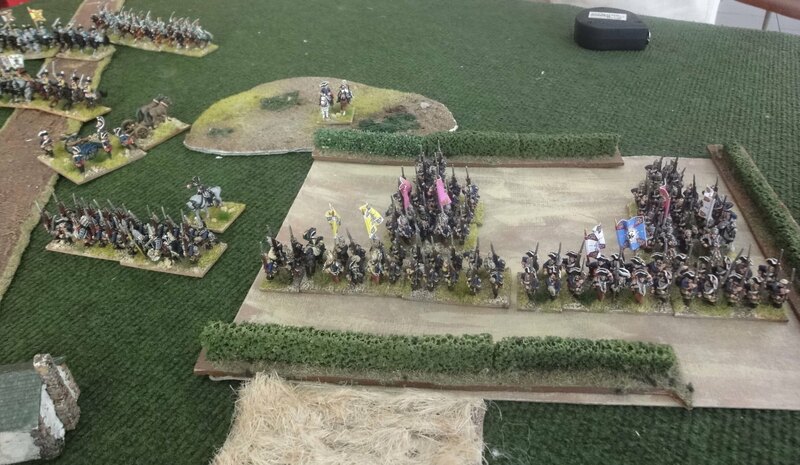 Doc Vag sending his Prussian cavalry to attack first! 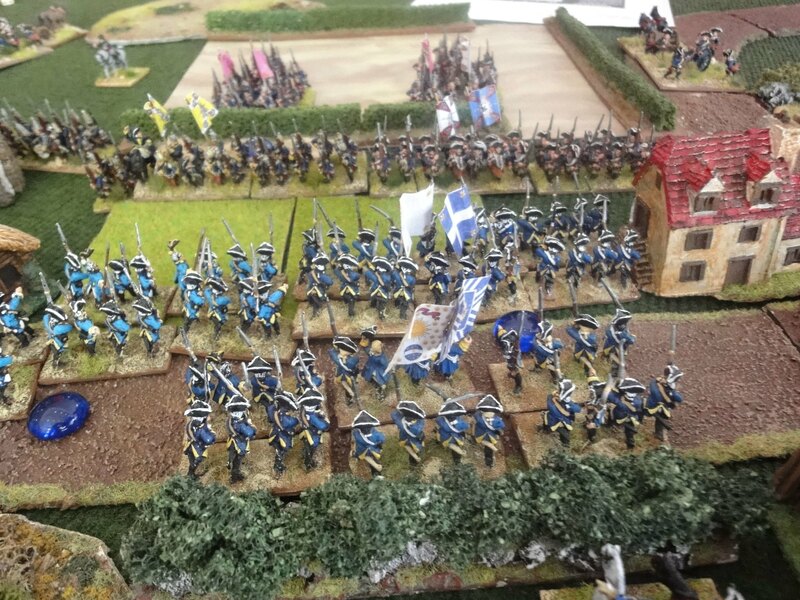 Von Seydlitz leading impetuously two cuirassier regiments supported by the famous Bayreuth Dragoons! 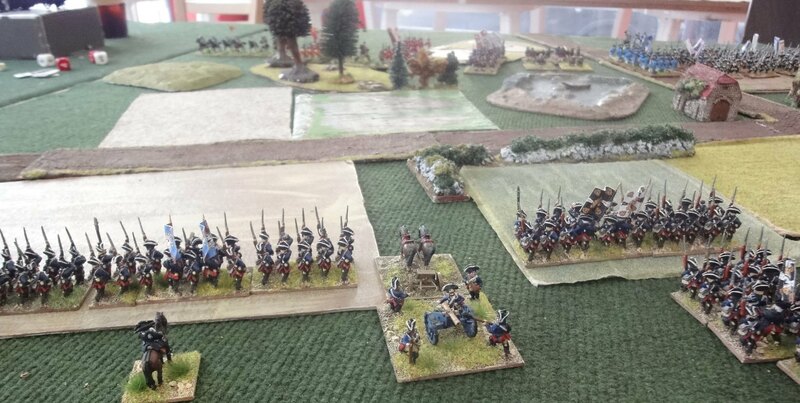 In the follow up, one French cavalry takes four hits but inflicts five hits to the Prussian cuirassiers! 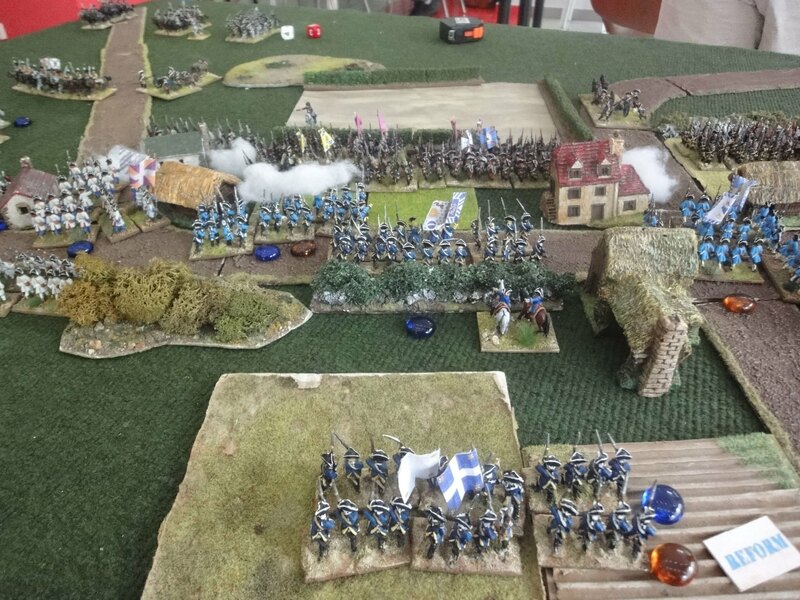 Now, it is the turn of the French cavalry to attack. 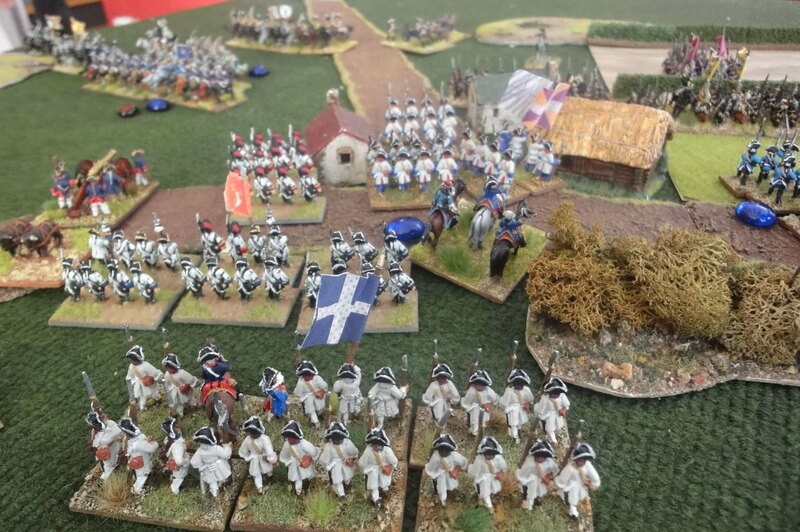 The independent Prussian Hussars are done for! 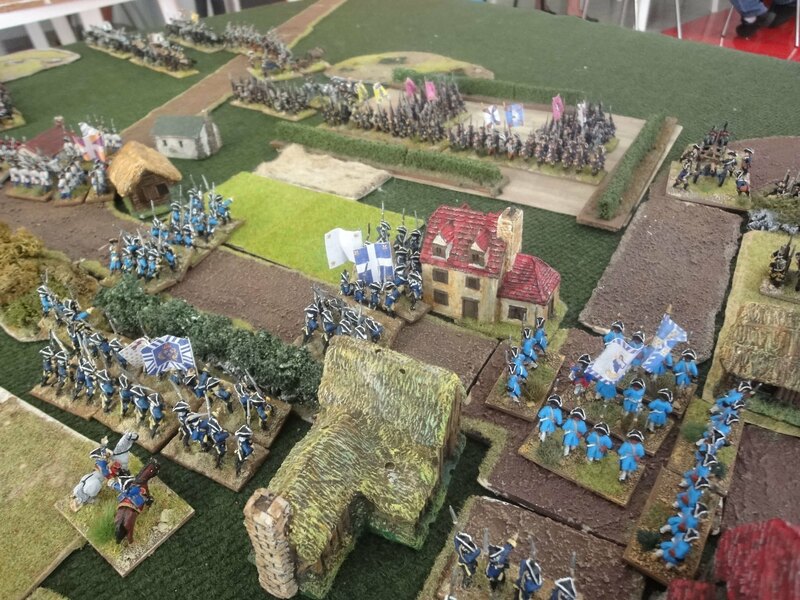 Prussian grenadiers attack and take the village! The fight between the town and the village rages. 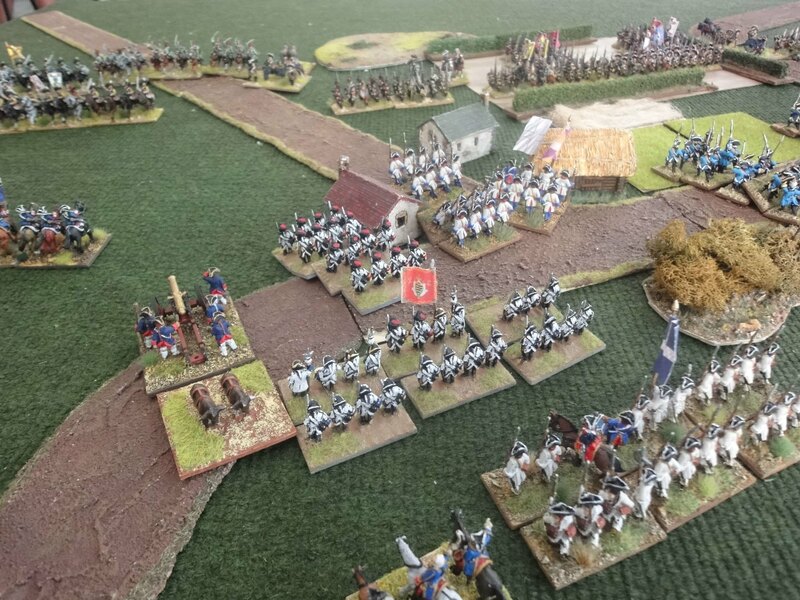 Another Prussian brigade converges east of the town in order to assault. Two French batteries (background) are firing over the pond and if they attack from the east their flanks will be exposed to canister fire. I order a fresh brigade to enter the table at my extreme right. 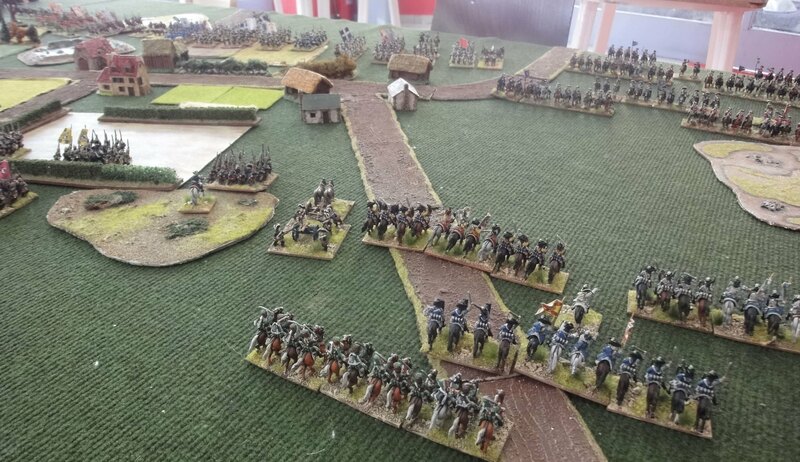 All that time, both my "Red" brigade in the woods and the Prussian brigade facing them dithered, the Prussians not even closing to long range. 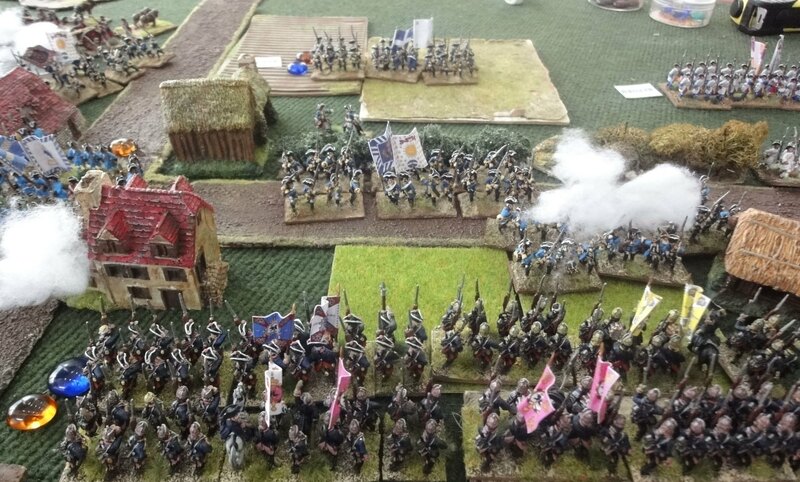 The Prussians attack between the town and the village! 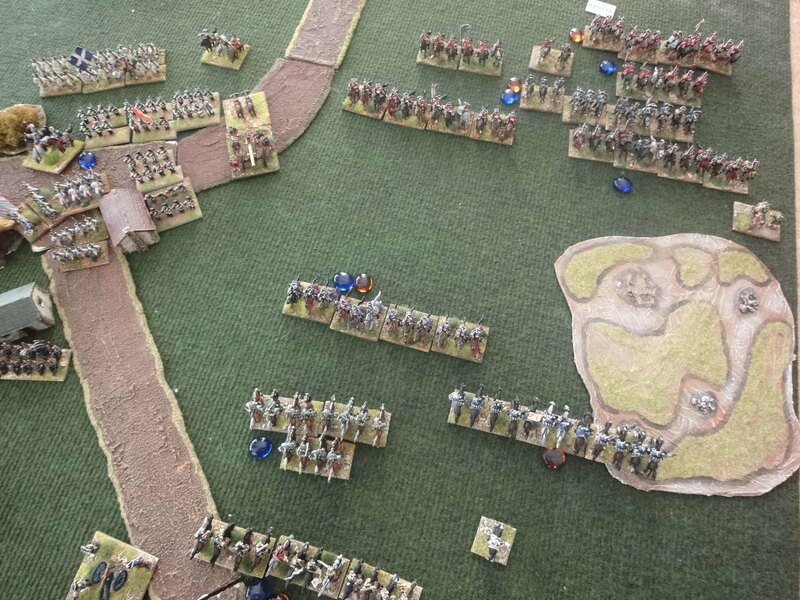 The place of the leftmost French battalion is now vacant, the figures looking the rest of the game from the heavenly heights of their box on the shelf. But the Prussians also are blooded! One battalion is done for and the one behind it has received four hits! 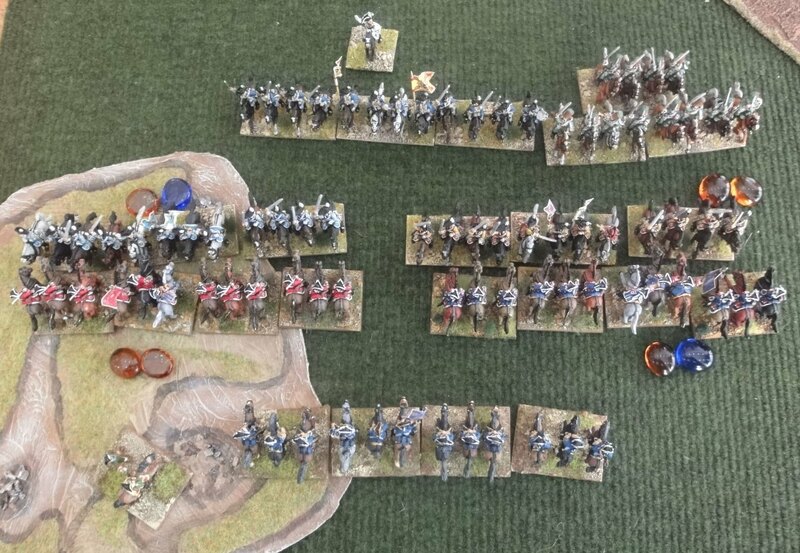 The Bayreuth Dragoons are done for!